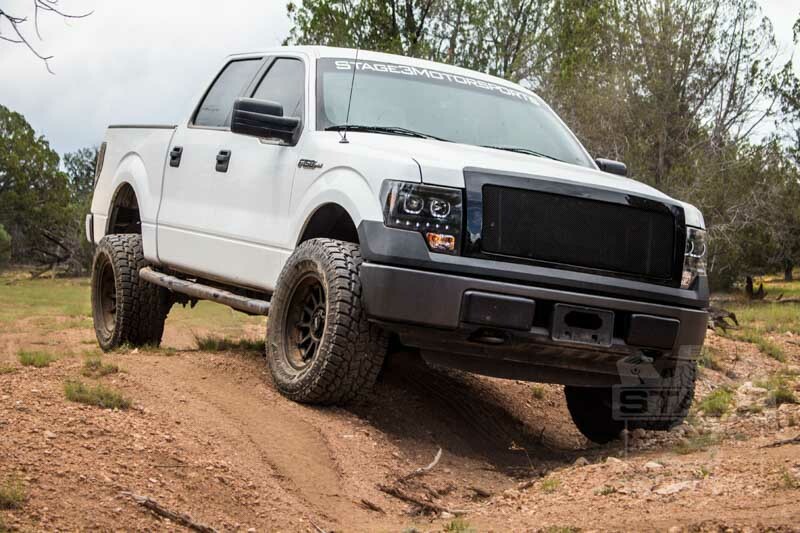 The stock front shocks and coil springs on your stock F150 are only going to take you so far. 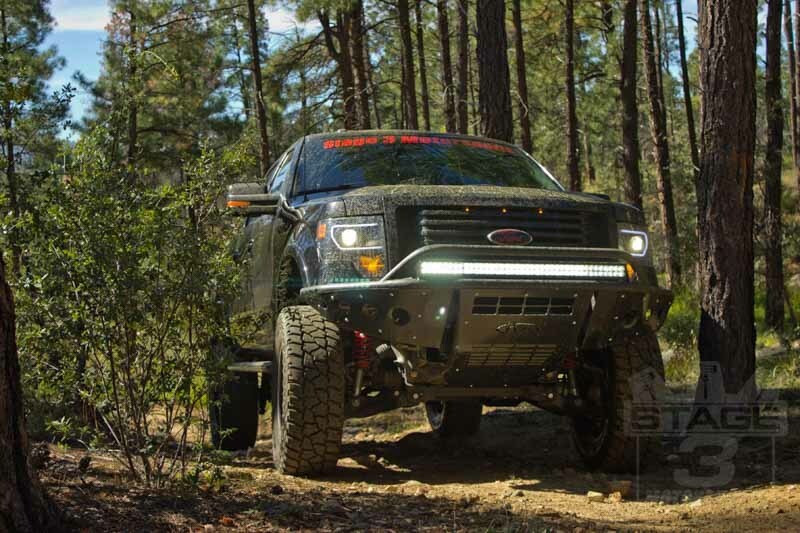 That's why Halo Lifts created is set of (2) high-performance 0-3" Adjustable Boss Coilovers that give you the control you need to take your off-road truck much farther and push your adventures much further than you ever though possible. 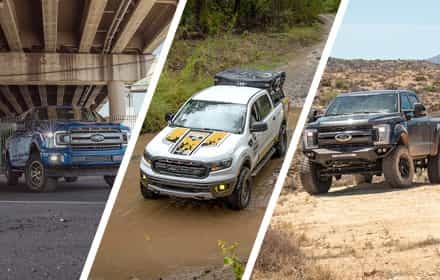 These powerful coilovers have vastly improved response, improved travel, and more significant articulation than your truck's factory shocks and coil springs so that you can throw your awesome F150 truck at just about any terrain without needing to worry about whether or not you'll make it home. 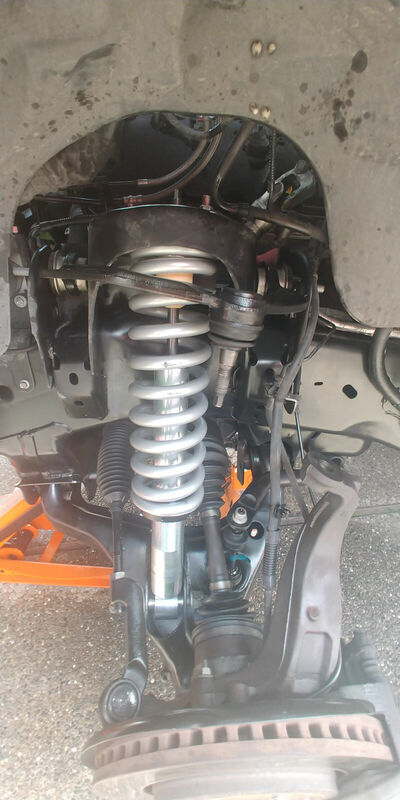 These powerful Halo Lifts Boss Coilovers install right in place of your factory shock/spring assembly as a direct bolt-on replacement, making it easy to get a massive performance boost out of your truck's front suspension with minimal effort. 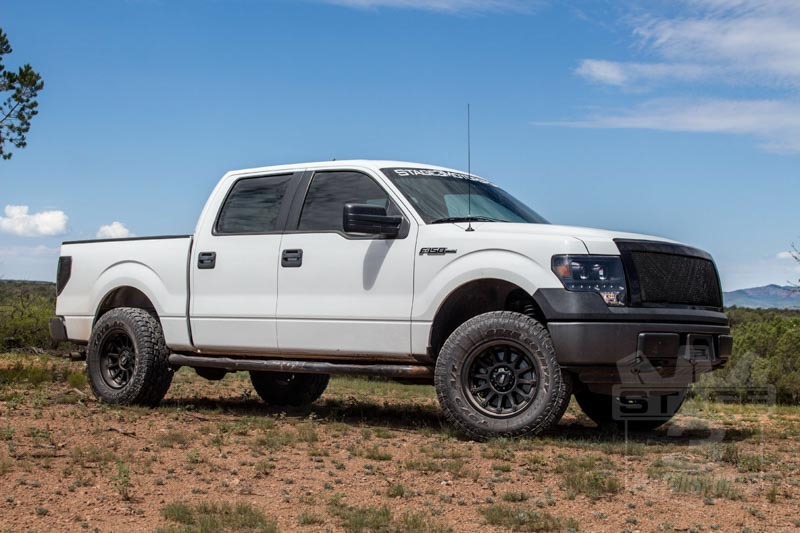 F150Lift's Boss Coilovers are designed and built from the ground up to take massive punishment while providing your off-road ready F150 the suspension performance and articulation it needs to handle tough trails. 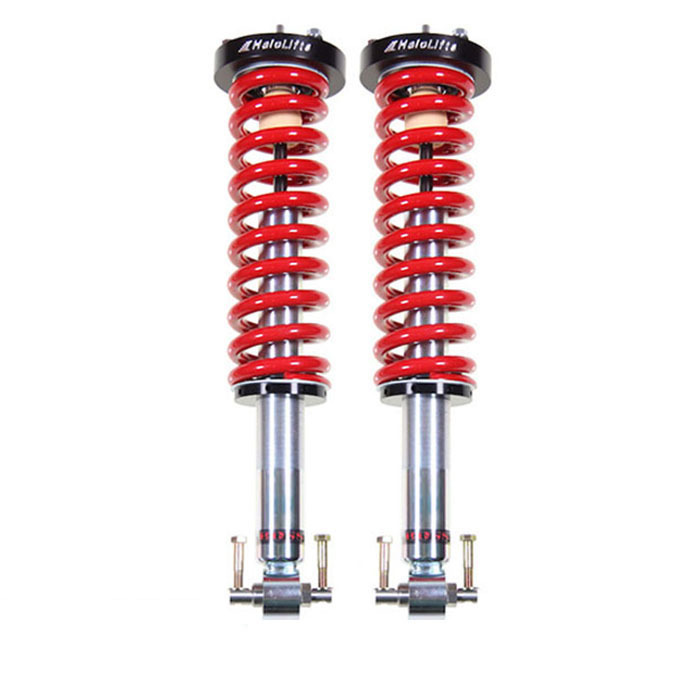 Each of the coilovers are built around a Clear Blue Zinc Chromate Steel Shock Body and 700 lb./in. Eibach Coil Spring. 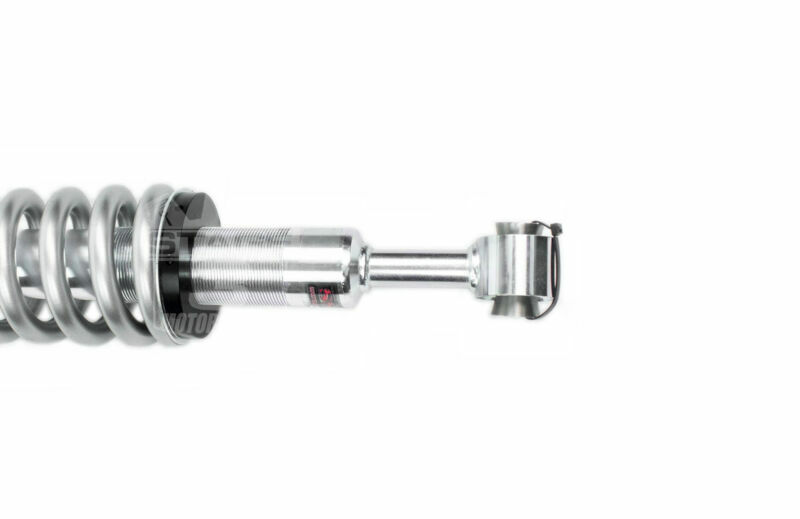 The large diameter of the shock provides room for a big internal oil reservoir that helps improve overall performance while improving heat dissipation to keep fade extremely minimal. 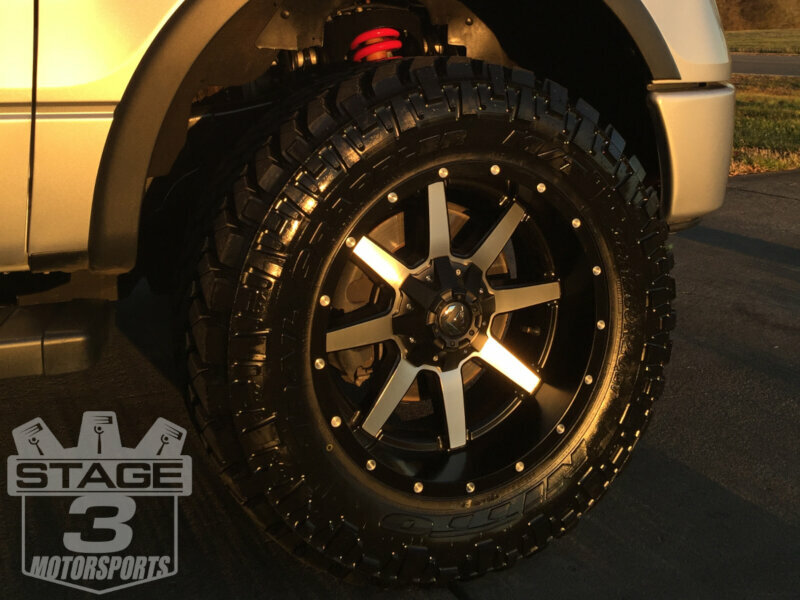 The coilovers each come with a cool "Halo Lifts" logo and look amazing behind your off-road wheels and tires. Their gas-charged piston design provides for excellent levels of response while specialized valving provides great ride on and off the road. 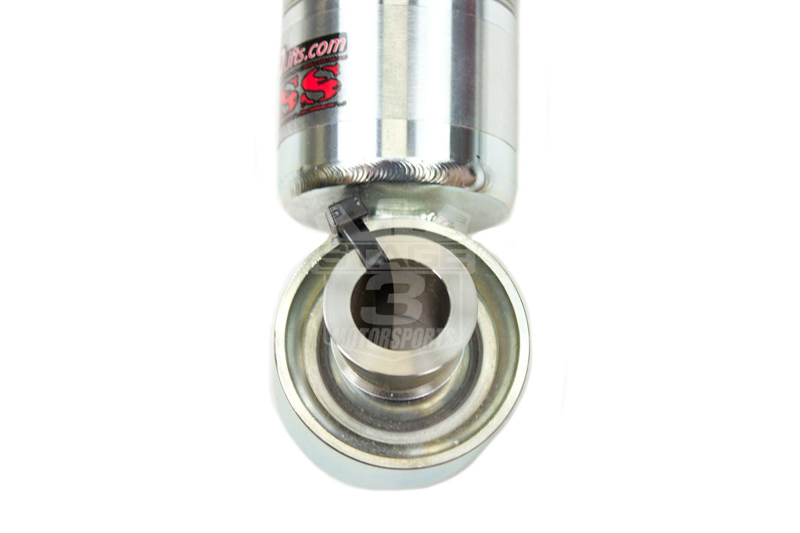 The coilvers can add up to 3" of lift and come with installation hardware, and detailed install instructions. 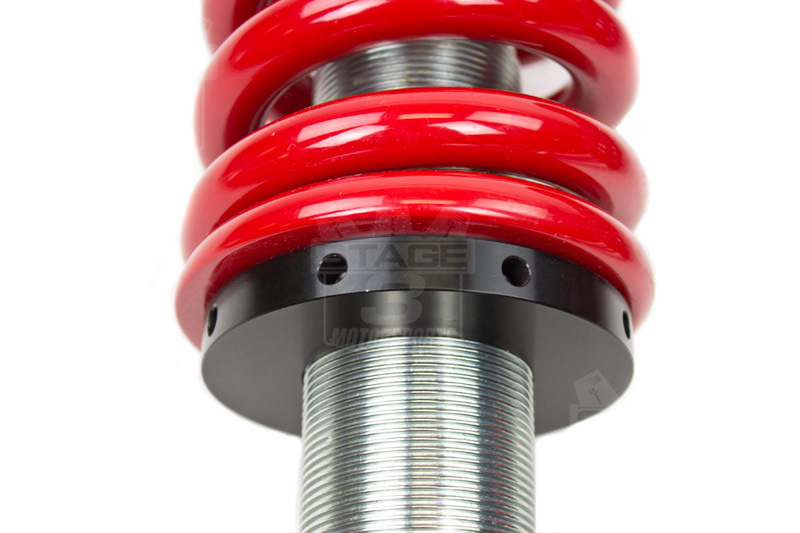 Color Options: The coilovers come standard in a Silver Powder Coat Finish. For $40 additional, you can choose from 5 other upgraded colors to match your style and color scheme. Use the drop-down menu above to select an upgraded color. Signature Required: this kit requires a signature for delivery. Please ensure someone is available at your specified shipping address to sign for any and all packages. So far so good. Upon install I got 3 inches of lift which okay but only needed 2 1/2 to be close to level. I installed Raptor wheels and tires. 315/70R17 and had no rubbing or clearance issues. I did end up with a camber issue which was straightened out with an alignment. I do think the spanner wrench leaves a lot to be desired for $20.00. It should have been better made. Just installed after living with a 2 level kit, no comparison, truck with 295/60/20 Nittos drives so smooth now, by far probably one of the best upgrades I've done, would not hesitate to recommend, just go for it, you'll love it. I didn't realize how bad the factory set was until these were put on, smooth, controlled rebound, no jarring, just soaks up the bumps in the road. 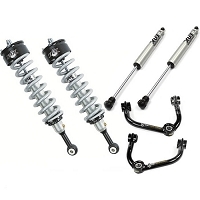 I purchased the Boss Adjustable Coilovers after having the RC 2.5 spacers for almost a year. The spacers bang and clank over every bump, and my tires rubbed pretty bad. 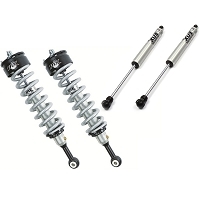 With the Boss Adjustable Coilovers, there's no banging, clanking, or rubbing with the coilovers set at 2.75. These were the best investment so far. Next step is the Boss Rear Shocks. These coil overs arrived quickly, They were exactly as described and were a breeze to install. They seem to be pre set around 2-2 1/2 lift.The ride and improved front end control are great. Stop searching around and buy these! Money well spent. I will be ordering the longer upper control arms to finish it out and get the perfect alignment and ride. I bought my coilovers in December of 2014 with 2 inch blocks in the back, giving my truck a small rake in the front with the coilovers set at 3''. After having them installed for about 8 months, my driver side coilover busted after going over a speedbump at a sharp angle. 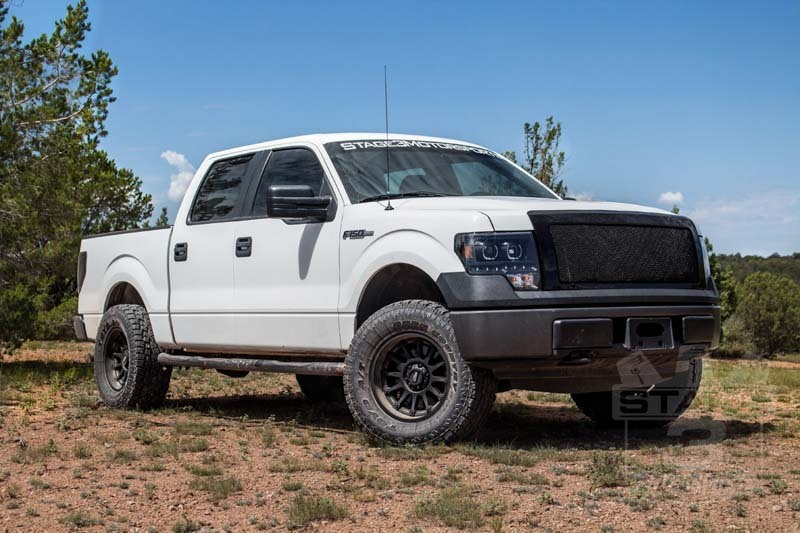 I called F150 Lifts and talked to Alex Leedham who told me that my coilovers were the first edition, and could break when hitting bumps at sharp angles. Alex had a new set of Gen 2 coilovers packaged and ready to ship to me within 5 minutes. Cannot say enough about their customer service. Great company, and my new coilovers have held up great so far. Great ride and plenty of room to clear 33s without trimming. Will be testing the clearance with 35s as soon as my 33s wear out. Love the adjustability and the red springs that match my silver/red theme. Highly recommend this product to anyone looking for an aggressive look. Good looking product. Good packaging. Better ride. Still playing with spring settings. Easy to adjust. Not the best spanner wrench, but does do the job for adjustments. These BOSS coilovers are very stiff, even after 2-3 thousand miles on them. I have mine set at 2 and was told it would ride really well at that setting, but it doesn't. The spring is simply to stiff. There isn't to much difference between these and a lift spacer. I would not recommend these to anyone especially for the price. They are easy to install and look good but that's about it. Great quality for a decent price; good road manners with reasonable off-road capability. Certainly not made for prolonged off-road use over several miles. Had the top cap and plug on my driver's side coilover work itself out of the shock tube after a 15 mile trip over rough roads. Like I said great for a budget and good quality over some of the cheaper brands, but by no means a serious off-road coilover. You get what you pay for. The installation required 2 jacks, Jack stands and decent Air powered impact guns and wrenches. If you dont have these tools then get some or pay someone to install. Swap required diaconnecting lower control arm, spindle, seat bar and then old unit comes out. The shocks are set at 2.25 inches I believe. Which not only leveled truck out I even have a slight reverse rake now. I will proba my readjust once they settle a bit. Ride is super smooth on freeway which is nice and off roading thus far has been easy. I do think the control arms are nearly maxed out at current setting thus I see replacing them soon. 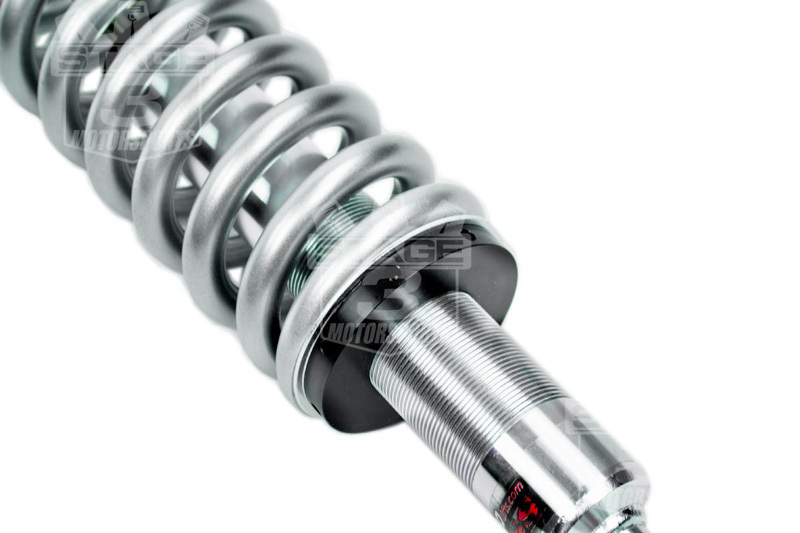 Good quality Eibach springs. And the Shocks are of very nice build quality. These are much more heavy duty than stock as well. 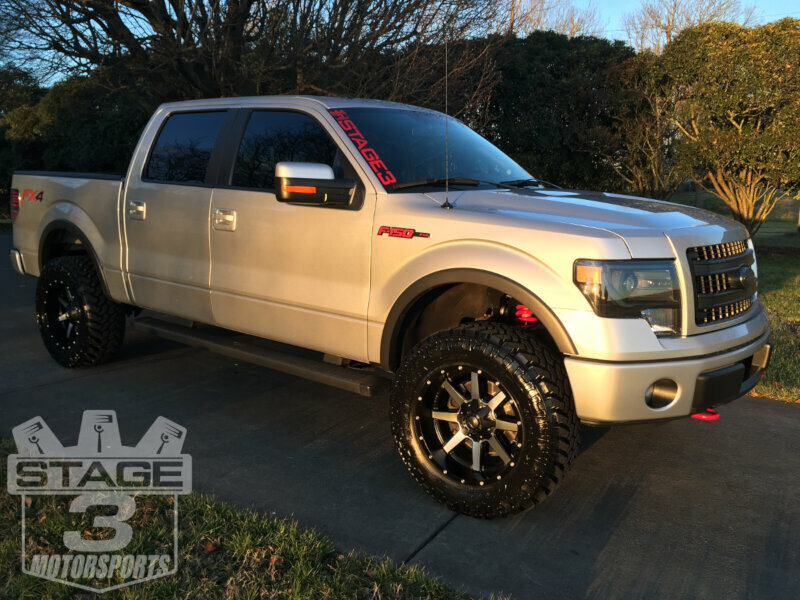 Greetings, I have a 2012 FX4 Eco with 2" level kit and 295/60/20 on stock rims.. I bought the Boss Coil Overs to replace the 2" level kit, do I need to find the original factory spacer that sat on the factory coils, or does the boss shock mount directly without them? The Boss Coilovers are a direct, bolt-on replacement for the factory struts and no other spacer should be required. There is a picture of blue coilovers but it's not in the color choice drop down menu. Is the color blue available? Unfortunately, the blue powder coat coilovers are no longer being offered. Part of the issue is that it was kind of a generic blue color that didn't quite match Ford's factory blue/bluish paint colors. 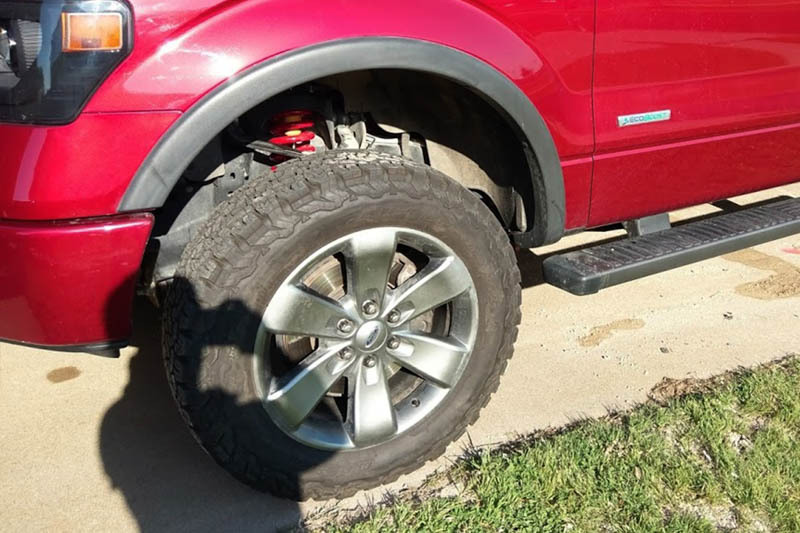 I want to level out my truck and fit 33 - 35 inch tires. Will this work to do that on the stock 20" wheels? These coilovers can work, as long as you're staying under 35" tires. You may also want to consider grabbing their optional spanner wrench, as they come pre-set at around 2-3/4" of extra ride height which can cause some rear rake. 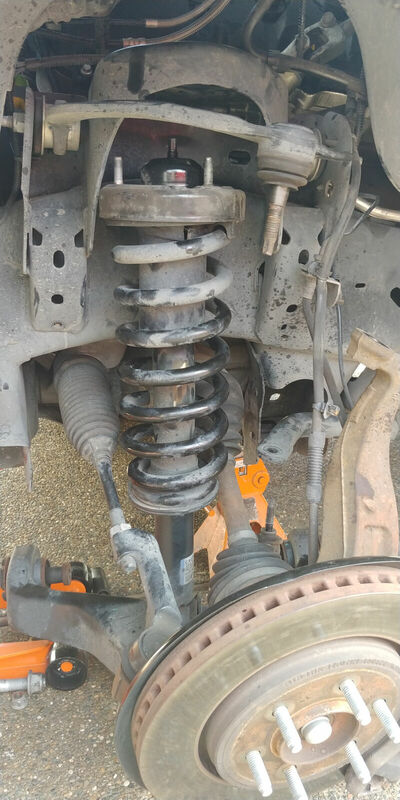 How offer will these shocks have to be rebuilt? They shouldn't have to be rebuilt for a good amount of time, depending on how hard you end up driving them. 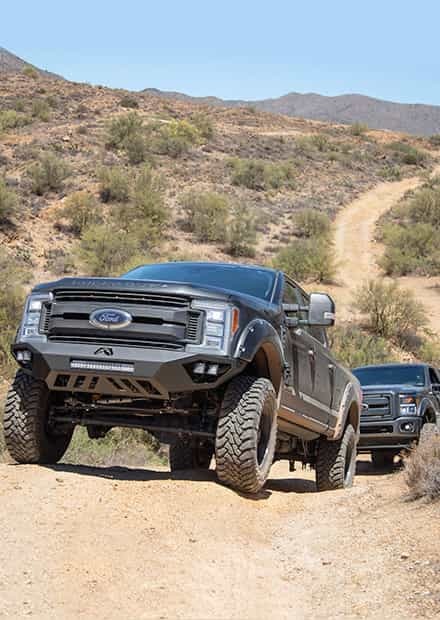 Still, they are rebuildable, and will need to be sent in to F150lifts for the work. The actual amount of time between rebuilds is simply on an "as-needed" basis. Can i use these with my stove 17" rims? If not do you have any lifts that would? 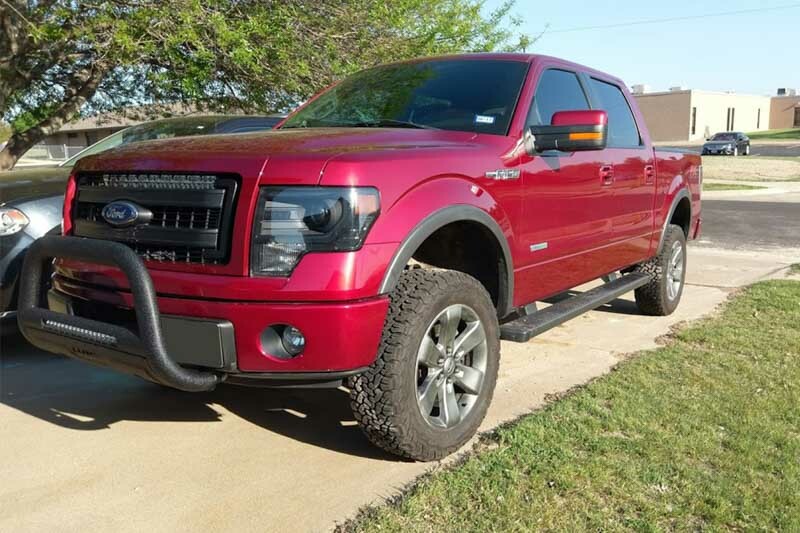 2013 f150 ecoboost 4x4 S.crew thanks! Yes, you ca use stock 17" wheels with these coilovers, though your tire options will be somewhat limited, if you want to avoid rubbing. If I use thes coilovers set at 3" with camburg UCAs can I use 305/70R17 on my stock 17" rims? 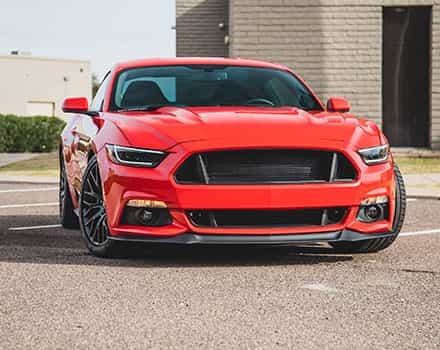 You would not be able to use those wheels and tires with the Camburgs without adding spacers, though you may be able to get away with them using the stock control arms with only minor rubbing. These coilovers actually have an extremely smooth street ride, so if you want to firm that up, you're probably better off going with a 2.5" coilover of some sort. That being said, the BOSS Coilovers handle themselves fine off road, as do the Fox 2.0s. 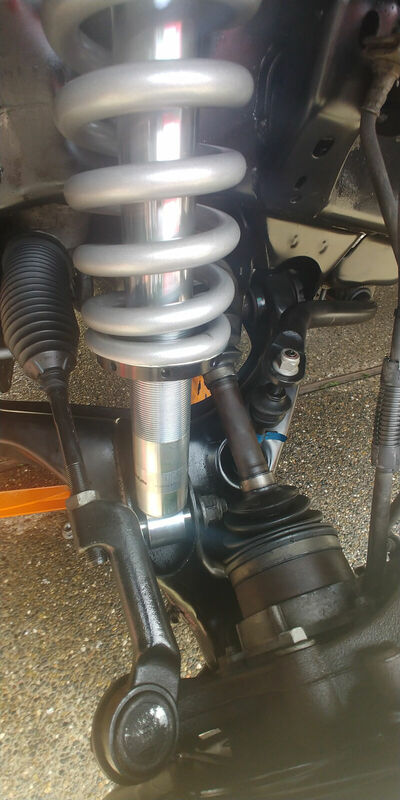 The Bilstein struts do decently, but if you are into more aggressive trail riding, then a coilover is a better solution. The real difference is that the Boss coilovers can add up to 3" of height, while the Fox 2.0s can only add 2". Either choice is excellent. 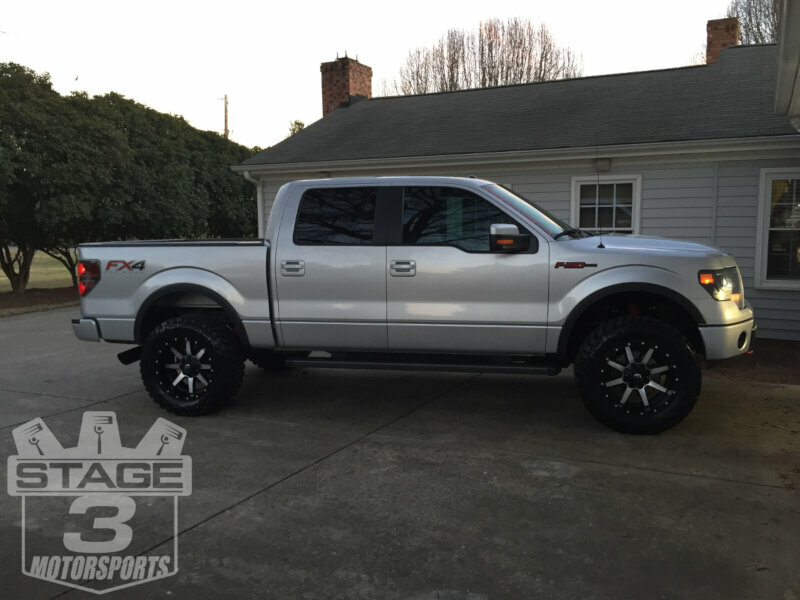 I have a BDS 6" lift on 2011 F150. 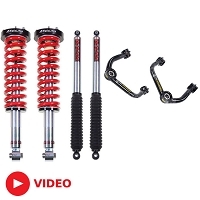 I'm looking to get 8" out of the BDS lift, are these coilovers the solution and are they already sized to fit the current lift? 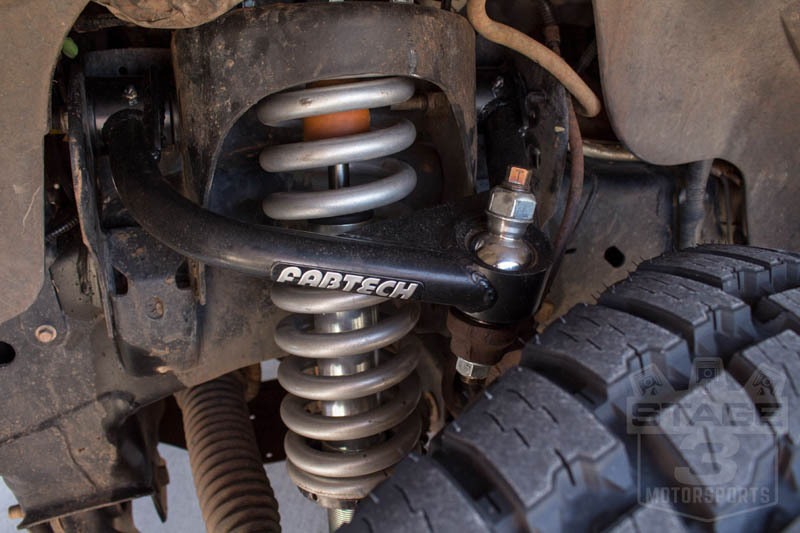 You can use these coilovers with the BDS Basic 6" lift kit that comes with front strut spacers, however, you'll actually need to lower the ride height of the coilovers using their adjustment collar and tool in order to get them to fit onto your truck. You'll also likely need a driveshaft spacer and something to lift the rear out of your truck, unless you want a ton of rearward rake. I have a Fabtech 6" lift with the strut spacers at the bottom of the stut. Will these boss coilovers work as a direct replacement, or will I need to subsitute top spacers like you did with your Eco build? Would the camburg UCA's work with that set up as well, or can you suggest a better UCA option? 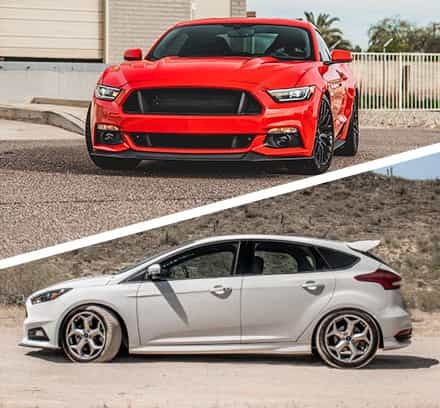 Since these coilovers are OEM replacements, and Fabtech's spacers are designed for use with the OEM struts, you should be fine to use Fabtech's included spacers, but you you would not be able to use the coilovers as a standalone. Since you're not going to have the same issue with the strut spacer pushing the upper coilover mount down, you ought to be fine to use any UCA you want, and Camburg's would be an excellent choice. This says for 4wd, is there a product for 2wd? If not what would i have to do to make this work? 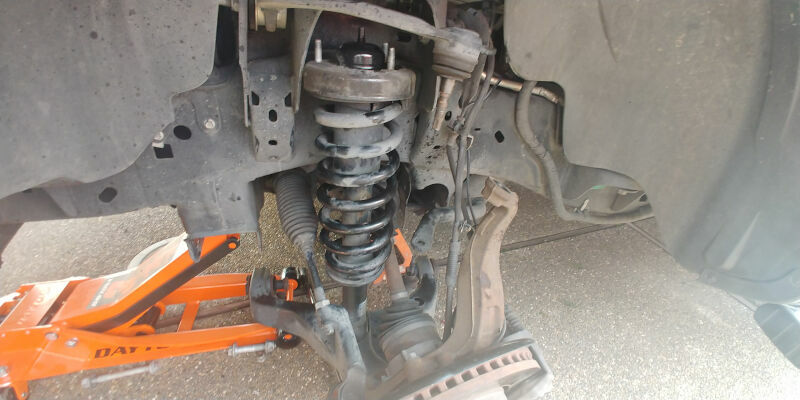 Also are the upper control arms the same on 2wd and 4wd? 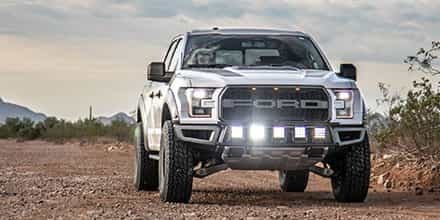 These coilovers will technically fit a 2WD F150, however, you will get more than the quote lift, which could potentially be a bad thing when it comes to your UCA and LCA angles and lifespan. 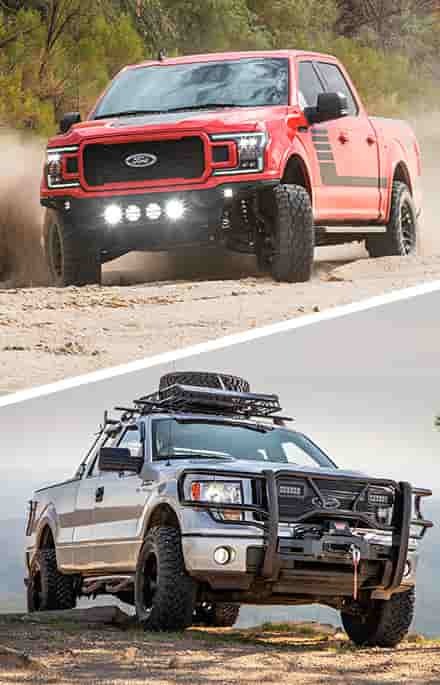 Aftermarket UCAs will fit both 4WD and 2WD F150s.